1. In electronics, signal attenuation. 2. Gradual loss of strength or intensity; degeneration. 3. In education, the stepwise withdrawal of instructional prompts to determine whether a student can perform a new skill on his own. fading skin coloring. See Arabian fading syndrome (below). Declining in body condition, general health, activity and productivity. general health is unimpaired. 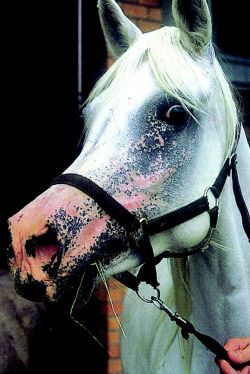 Affected horses, usually Arabians, gradually lose their skin coloring on round, depigmented macules and multiple patches, most obviously around the muzzle and the perineum. It is a noninflammatory leukoderma. The cause is unknown. See also vitiligo. Called also pinky syndrome, lavender foal. in ostriches, used to describe any chick that is failing to gain weight and grow. see Arabian fading syndrome (above). apparently normal young are born, but within the first week or two of life individuals within the litter gradually weaken and die. Not a specific disorder, but generally applied to infectious causes. (OFS) a syndrome of unknown etiology causing wasting of chicks 1 week to 5 months of age with high morbidity and mortality.